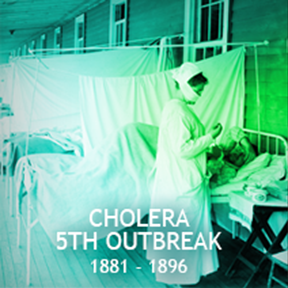 The cholera pandemic of 1852 – 1866 spread along trade routes throughout India, and from there to Russia, China, France, England, and the United States, claiming over 10,000 lives in London in a single year. Caused by the bacteria Vibrio cholera, the disease is spread through water contaminated with sewage and is endemic to plankton and shellfish in the oceans of the world. 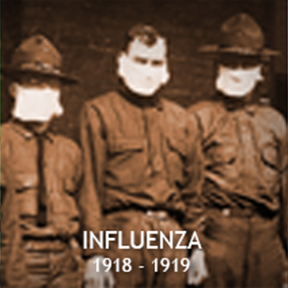 The influenza pandemic of 1918-1919 was the deadliest pandemic of the twentieth century, killing between 20 and 50 million people worldwide. Influenza virus travels from host to host on droplets released from infected individuals through coughing and sneezing. Acquired Immune Deficiency Disease has resulted in 38 million deaths worldwide. At present 37 million people are infected with HIV. 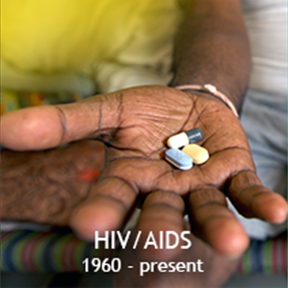 AIDS is caused by Human Immunodeficiency Virus, a retrovirus and spreads by sexual contact. 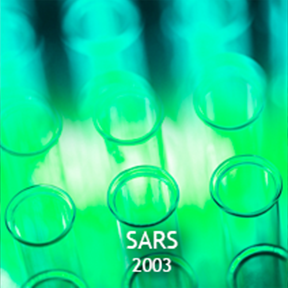 Severe acute respiratory syndrome (SARS) spread globally through air travel and infected 8,098 people worldwide, resulting in 774 deaths. It was caused by the coronavirus (related to common cold virus). It spread by close person-to-person contact and was airborne. 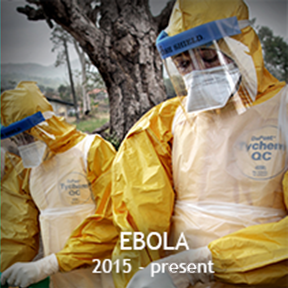 Although outbreaks of Ebola have occurred since 1976, the current outbreak is the largest and most extensive. The disease is caused by the Ebola virus, which is transmitted through direct contact with blood and body fluids of infected individuals. A vaccine was developed in 2016 that provides 100% protection against infection by the virus. With a new outbreak of infectious disease erupting every 12 to 18 months somewhere in the world, it is of utmost importance that the public have an understanding of infectious diseases, and the skills and vocabulary needed to find and apply the information in order to respond appropriately. Using an overarching storyline of the recent Ebola epidemic and measles outbreak, the resources are organized into four modules that can be used as a coherent unit of instruction or individually as separate topics. The following stories set the context for student learning about infectious diseases. Students should read these stories prior to carrying out the modules as a way of engaging them in the topic of infectious disease and raising any questions they might have. This first story discusses possible origins of the Ebola epidemic. The second story describes the 2014 measles outbreak in Disneyland and the possible reasons for it. How do these stories connect to the modules? Viruses, a type of infectious agent, cause both Ebola and measles. Viruses have many features in common, but viruses found in nature are also very diverse in their structures, the organisms they infect, how they infect organisms, how contagious they are, in the symptoms they produce, and how infections can be treated and prevented. In order to understand why these recent outbreaks have occurred and what can be done to prevent them, you need to understand the biology and ecology of viruses, their different modes of transmission, how they cause disease, their mechanisms for spreading to cause outbreaks and epidemics, and the options that exist for prevention and treatment. Learn about infectious agents as well as epidemics and pandemics past and present. Explore the science of tracking the origins and causes of outbreaks and epidemics. Investigate the many factors that determine whether outbreaks and epidemics of emerging and re-emerging diseases will occur. Learn about how infectious diseases can be treated and how personal behaviors, public health programs, the immune response, and vaccines can protect against infection. Copyright © EDC 2016. All Rights Reserved. This material is based upon work supported by the National Science Foundation under Grant No. 1518824. Any opinions, findings, and conclusions or recommendations expressed in this material are those of the author(s) and do not necessarily reflect the views of the National Science Foundation.